Beat the Summer heat with our upcoming releases for August! Add Munchkin flavor to any card game, and draw outside the lines with a new coloring book! What are the most important letters to a munchkin? L-O-O-T. 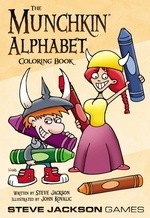 Perfect for children (or the young at heart), The Munchkin Alphabet Coloring Book is a wonderful introduction to the world of Munchkin. With drawings by John Kovalic and 26 alphabet verses written by Steve Jackson himself, this is the ultimate crayon canvas. And of course, you'll get 10 promo Munchkin cards! You'll be a modern day Michelangelo. Or maybe Spyke-elangelo. Munchkin Playing Cards give players a whole new way to enjoy the artwork of Munchkin! Ian McGinty, illustrator of Munchkin Guest Artist Edition and Munchkin Knights, is back with a set of 54 classic playing cards with traditional suits. 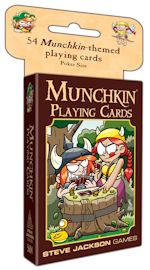 Take a break from your game of epic Munchkin with a quick round of poker, or a munchkin's true favorite: 52 card pickup. These are standard playing cards; a copy of Munchkin is not required to play. Preorder today at your Friendly Local Game Store!